As well as all the powerful applications that the Series 5mx has to offer, its performance will ensure that information is always at your fingertips. Large phone and address memory. Downloadable to a P.C., for backup is case of a data crash. Limited, but very useful, word processing. (If you don't mind pecking on a small keyboard.) Connects to Internet, sends E-Mail, and Faxes. Lot's of shareware available on the Internet from fellow Psion users. (I downloaded a chess playing program written by a Psion user in Belgium that only uses 30K - and I haven't beaten it yet.) You can also write your own programs on it (in it's own basic type language.) And it has spreadsheet and data programs that are compatable with your P.C. Another plus - it uses regular 'AA' bateries. Since I use the AC adapter when at my desk, using the batteries only when away, they last over a month! The reasons I traded up to a Psion 5 are: The screen's backlit. It has a bigger keyboard (but still not as easy to use as a full-size keyboard.) It has enough memory to support E-mail, Fax, and Internet connection programs at the same time. The spelling function has many useful features, including showing a full line in spellcheck so you can see the context of the word. AND MOST OF ALL - The touch screen, which is as good or better than a mouse, makes moving between programs, choosing options, zoooming in and out, and highlighting text much quicker. And you can draw pictures directly on the screen with the stylus. To put it simply - I have my whole life on this Psion 5. Since it fits in my side pocket, I always have it with me, and can jot notes while I'm shopping or travelling - times when I wouldn't have a full size laptop with me. Those are the PROS - here are the CONS: (1) Psions have their own language. Everything has to be translated if you want to see it on a P.C. Once you set this up it goes quickly - but you have to be hooked up and the application has to be installed and there's always a chance that some sort of computer clitch will prevent the connection. This does not affect sending E-Mail or Faxes from the Psion 5 itself, which appear as printed text to the addressee. (2) There's a small half-to-one-second delay for some functions to occur, like opening a program. It's not always instant, like a P.C. (3) The screen is a little difficult to read without the backlight. It's better with the backlight, but that uses up the batteries much sooner. (4) (Minor problems) The coating on the case peels, and the stylus tends to slip out of it's slot. (5) The Psion records memos using buttons on the outside of the case, but this uses so much memory I hardly ever do it. However, it would be practical for short notes you erase after transcribing into text. (6) There is a limit to the memory. I've added a few pages of text a day for a year, and soon I'm going to have to move some files permanently to my P.C. - or delete the E-Mail, Fax, or Intenet programs. This estimate is very rough, but gives you some idea of the memory capacity. At this point I should say I am not an employee of Psion, just a fan who uses it every day and is glad to pass on my opinion to my fellow Amazonians. I purchased the Psion series 5 because, at the time, it was the only PDA with a truly usable keyboard. After CTS/RSS surgery, I found the Palm Pilot, et al, to be difficult to use. Graffiti was easy to use but the Pilot was uncomfortable. After buying the Psion to be everything that I wanted or needed. The keyboard is great for touch typing with 2 to 3 fingers. As with any new OS and keyboard, it takes a while to become comfortable and profficient. After this brief initial phase, it became a delight to use. I would recommend the Psion 5 to anyone. I guess the best recommendation is that I bought one for my son to use! I bought my first PSION when I was due to attend an Austrian Economics Conference at Claremont McKenna in the early 1990's. Rather than lug my overfull Filofax on the 10 hour flight from London, I opted for the PSION rather than a laptop. The little computer did an admirable job but the screen was a little samll as well as dark. When the series 5 was launched I replaced my existing one with this current model. Why not choose the Palm. Good question. I wanted a computer that could handle word processing as well as a spreadsheet and be more than an organiser. I wanted something small and inobtrusive that could fit in a jacket pocket and that was stand alone. As a reuirement was ease of portability I did not want to carry around all of the little gadgets and add ons that make this little computer such a remarkable device. I preferred a keyboard. These were all advantages over the early Palms. Why am I writing this review now after years of faithful service? Another good question. This machine has been dropped on several surfaces, it has had hot tea spilt on it, it has been passed around many, many students some of whom went on to buy later models but now it is at the end of the road. the company is getting out of hardware and focussing on software and applications. My PSION is still going strong. I prefer it to my Palm and Clie and BlackBerry. The capacity is good and I still have no add ons. I just wanted to place on record my testimony about the efficacy of such an excellent machine. Alas no matter how good the product, if the market does not cast it's vote of approval, it is doomed as is the case with the PSION family. I bought mine in 1995 in Europe. It worked fine until last year when the screen stopped working. Even though the warranty period had expired Psion USA repaired it free of charge, within about 2 weeks of my shipping the product to them. I have also found the technical service in the US (via e-mail) to be outstanding. I have now upgraded to the Series 5mx, which has twice the memory and a faster processor. I only did this as the old one was stolen. I would not recommend upgrading unless you need the extra memeory. The only other advantage of the 5mx is that the paint on the casing is much more durable. ...I would certainly recommend the 5mx to anyone buying now. The diary and address book work fine. I had about 1700 addresses in a 614k file. The spreadsheet is compatible with Excel, but with less functions. Sketch program is similar in performance to MS Paint. It is possible to record voices or sound, I have never found a compelling use for this feature which uses memeory quickly - 60 seconds takes about 500k. The monochrome (grayscale) screen is OK. 2 std. AA batteries less about 20-24 hours, less if the backlit screen is used. The main differnce I notice betwwen the EPOC operating system and MS systems is that the EPOC system never crashes - not once in 5 years, and the computer boots up instantly. I have had the Series 3a for two years. It was given to me, and has enormously helped ot organize my life. The features that enable you to set alarms in variable advance of an appointment come in especially handy. I have also written 6 page script outlines while in an airplaine on the word section and downloaded it into word on my macintosh. For the user who complained that this function didnt work, perhaps he should contact the manufatrurers in England to get either the appropriate software or instruction booklet. It worked for me. I can ony imagine that this version is better. And a little advice for the man with the battery problem. I have a double AA battery charger and two sets of rechargable batteris. (cost around $15) This works fine, I never need to buy batteries, they work for two weeks before I need to recharge, and I dont pollute the environment. Psion's been around the handheld industry as long as the rest of the bigmanufacturers, and they're not changing their large-scale design for anybody.While the latest Psion, the 5mx, looks similar to the Psion 5 (which is in turnsimilar to other previous iterations), it integrates various internal changesthat make it a more powerful machine. The Psion's large format aims at users who need more power than a Palm-sizedpalmtop and more portability than a notebook PC. While you won't be using the5mx in hand that often--it's a bit too bulky and weighs three-quarters of apound--its well-designed case sits flat on a table or even your leg. And itstays steady while you're typing or tapping on the screen with the comfortablepencil-length stylus. It's also one of the few handhelds anymore to ship with akeyboard, and a very usable one at that. The Psion can connect to the Internet wirelessly via its IrDA (infrared) portwhen using specific models of wireless phones or pagers--or via the optionalPsion 56 Kbps travel modem. In our tests, PC synchronization worked seamlessly,with speedy transfer even using the serial port interface cable. Armed with 16 MB of memory/storage (compared to the 8 MB of the Psion Series 5before it), the 5mx opens applications quickly and multitasks smoothly. It wasalso refreshing to be able to actually type in our handheld's word processor ande-mail programs, even if we had to hunt and peck for a while before we got usedto the smaller keys. Psion 5mx is a real small computer - not just a toy like Palm Pilot. It is powerful; it can communicate with your PC; its operating system is incredibly stable and allows real multitasking; the supply of software (commercial, shareware, freeware) is stunningly rich. And, it DOES HAVE A KEYBOARD. I own a Psion for one year. My experience: I used to carry a bulky notebook almost wherever i went. Now, my notebook can rest in peace, except when I need to do presentations or some extra difficult calculations in Excel using sophisticated worksheets with macros. Now, I can work almost anywhere. I wrote a number of articles for newspapers and magazines in Prague, CZ, and even one chapter of a book, which I'm currently preparing. I can't imagine I could do the same with a Palm or similar toy. My Psion already paid for itself. Last, but not least, it's different and it's beautiful. It makes envy among Palm-owners. I remember a panel conference, where I sat next to a Palm-user, who wrote his notes on a clumsy add-on keyboard. I did not regret that I paid a premium price for a Psion. To me, as a native Czech speaker, it is also important that Psion enables using Czech alphabet accents (not important to most U.S. users). However, there is one shortcoming: people with big hands will find Psion's keyboard too small. My hands are of normal size, so I don't do much typos. But if I had more robust fingers, I would probably decide for a subnotebook with somewhat bigger keyboard. 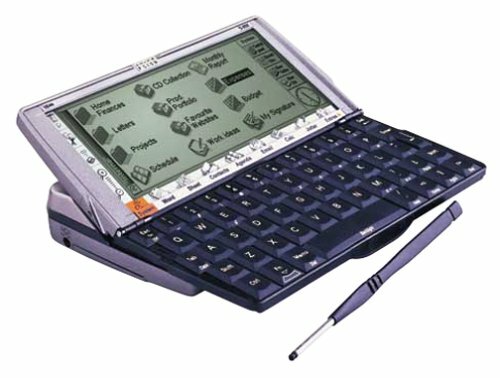 Psion announced they will no longer be developing PDA's, but will sell existing models while demand lasts, and continue to support for 3 years - until Dec 2004 at least. I work in sales and marketing, travelling internationally. I find the Series 5mx provides most of the functionality of a laptop - I use it to take notes in meetings, write visit reports, and for spreadsheet calculations. EPOC system never crashes and boots up instantly. Took 2-3 days to get used to small keyboard, which works well. The main shortcoming relative to a notebook is preparing presentations - there is software available for the Psion but I cannot believe it would work well with the small screen. Synchronization with Outlook is excellent with latest software. Connects via (included) cable at 112k or via IR port at 56k. Takes about 10 minutes to backup 5.4 Mbytes, and about 4 min to synchronize Agenda+2000 contacts. I sometimes use the IR port to transfer data to other Psions, also works with some cell phones. Fair amount of 3rd party software, the only one I have used for work is "Convert Pro", formerly free, ... I find it invaluable for converting currencies, English units to metric SI, you can add your own categories to the 18 provided. I have 2 games - Chinese chess and Go - but in general PCs are better for games. The "Time" program showing chart of globe with local times is invaluable if you deal with international locations all the time, I also use the Psion as my alarm clock when travelling. Batteries last about 20-24 hours if you do not use the backlit screen. This is more like a pocket PC rather than merely a PDA. I Love It - And It loves Me! Well, I like to think so, anyway. I spend more time staring lovingly at this thing than at my wife. I've had it for eighteen months now. Really an excellent product. Great keyboard, great memory, great battery life. Synching up to the PC was no problem. Small enough and light enough to take it anywhere. Stands up to the occasional knock. No flaws yet. I'm never without my Psion. 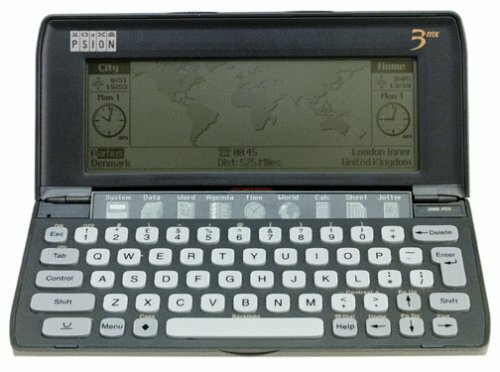 The design of the Psion is superior to other designs. The built-in keyboard is a bit small, but compared with other alternatives are to have no keyboard or carry a big keyboard with you to plug in. The 5 MX has been the palm-top of choice for me. I wish there was an updated model. Winner of the prestigious Byte Award for best hardware, the Psion Revo is a remarkably powerful, feature-rich, and lightweight PDA. An interesting alternative to Palm or Windows CE organizers, the Psion is stylish and slim and has a high-speed processor and built-in long-life batteries. To set up up the Revo, we followed the instructions in the Quick Start guide: We connected the AC adapter to the serial cable (the power cord does not plug into the docking station), hooked up the serial cable to our PC, opened the Revo's case, and slid the Revo into the docking station. (The Revo cannot fit into the docking station unless the case is open.) A green LED confirms that the Revo is properly docked and a red LED indicates that the battery is fast-charging. The battery charges to 85 percent capacity in just 1.5 hours and fully charges in 4 hours. The charged battery lasts about 12 hours. The Revo is based on the popular Psion 5, but with considerable cosmetic and technical improvements. You operate this organizer with the 14 touch-sensitive buttons that border its screen or by using the stylus to tap onscreen buttons and menus. Psion has made every effort to keep the operational controls above the keyboard, thus maximizing the space available for keys. Still, typing on this small keyboard requires much getting used to, and the keys' tactile feedback is not very satisfying. In our tests, we typed memos, made appointments, added addresses, and created a sample spreadsheet using the Psion's built-in applications. Agenda and contact information automatically synchronizes with your PC. For other files, such as those made using the Psion's surprisingly advanced word processor and spreadsheet applications, the PsiWin software transfers and converts the files to a PC-compatible format, such as Microsoft Word or Excel. The Revo's PsiWin software is also compatible with Lotus SmartSuite, WordPerfect, dBASE, and more. Psion licenses its Epoc operating system from Symbian, which explains why the Revo's interface looks only moderately similar to Windows CE. Subsequently, the steps to perform our tasks seemed intuitive--we rarely had to consult the manual, but we often didn't guess right the first time either. We recommend that you browse the extensive Revo Handbook (222 pages with index) for a proper introduction to the comprehensive suite of PIM applications and check out the CD-ROM for additional utilities and tools. The Revo's built-in applications are Calc, Time, Word, Data, Sheet, and Cascade. Additional applications include Today View, Agenda, Contacts, Phone, and Jotter. The Revo also supports e-mail, SMS messaging, Web browsing, PC synchronization, and connections to compatible mobile phones through its infrared port and an optional travel modem. 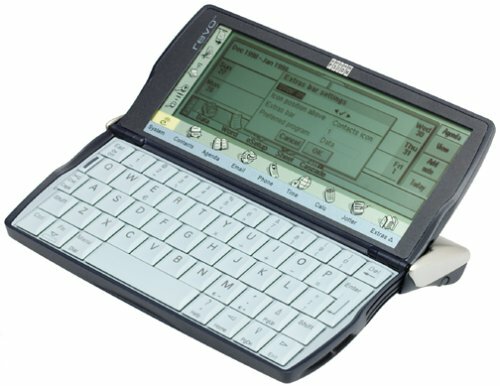 If you're looking for an alternative to both Windows CE and Palm OS organizers, consider the Psion Revo. (+) the clamshell case design is nice, no need for an additional leather/vinil case - you can just close the revo and slip it into your pants pocket. (+) good loudspeaker (no mike) - baware though, if you plan to carry the revo close to your ATM card - think again. Psion warns against it - the speaker magnet may harm magnetic card strips. (-) synchronization software: maybe it is just me, but i find PsiWin significantly inferior to palm sync. software, especially with MS outlook at your desktop. agenda synchronization does not copy meeting locations into the Revo, and meetings get duplicated after several synchronizations. also if writing e-mails at the revo, they do not synchronize properly to outlook mail. (-) 'hands only' browsing (i.e. not at a table or a desk) is less convenient than with palm / cassiopea type of devices. glad to see that amazon.com carries psions now - hope it will help to spread the word, and that we will see more and better quality third party revo software as a result. 4 years old - still the best PDA on the market ! The only PDA that combines a good keyboard with the right "pocket" size. The revo is now 4 years old, but still the best PDA on the market. I especially enjoy quick and easy look-up in databases, help files, calender. In fact, eventhough I have a Win 2000 PC by my side, I choose the revo to look-up contacts, meetings etc - it's faster ! In addtion, the installed applications work fine: contacts, calender, database, word, sheet, jotter etc. It's a pity the revo isn't developed any longer. It would have been great to see a new Revo-2004 including memory slots, MP3 player, color screen - but in the same casing. One of my key selection factor was the keyboard. I needed a 'proper' keyboard for my reports. I had use a Palm, Casio Pocket Viewer and other 'small' PDAs.. I had try using latest PocketPC hardwares and not to mention other PALMOS machines.. in the end of the day, its the PSION that is useable as far as I am concern. BTW, all my Psion are seconds/used..
Before using your travel modem, you need to check your Psion PDA to ensure that you've installed all of the software that came it. We tested the travel modem with the Psion Revo; to operate the modem, we needed to have Email Synchronization 1.0 and Web Browser 2.01 loaded onto the Revo from its accompanying PsiWin 2.3 CD-ROM. If you plan to use your travel modem internationally, you need to install the modem's included EasySwitch software onto your PDA. To set up the Psion travel modem, we started the Modem application and entered the settings specified in the travel-modem user's manual. We then ran the eSetup wizard to enter our ISP account information. We turned on the modem, started the Web application, and connected to our ISP. Surfing the Web on any handheld PC, such as the Psion Revo, can be tedious--the small screen makes it difficult to see Web pages in their entirety, and the tiny keyboard makes navigation challenging. However, it does help to visit Web sites designed for PDA visitors (such as Amazon.com Anywhere at www.amazon.com/anywhere). It's more practical to use the travel modem for sending and receiving e-mail, which is an intuitive process using the Revo's e-mail application. 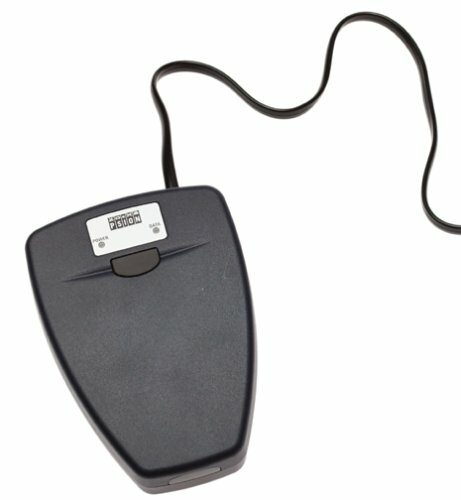 The travel modem requires an unobstructed line of sight with your Psion PDA and works well within its rated distance of 2 to 12 inches. One green LED indicates the modem is on, and another flashes as data is transmitting. During our tests, the travel modem (or the Revo) disconnected unexpectedly a few times. We saw no pattern to the disconnections, but it occurred less often when the Revo was in its docking cradle. In general, the travel modem works best for specific Internet tasks, such as getting e-mail or news that you can read offline. This modem lacks its own power supply but can use the one that comes with your Psion PDA. The travel modem lasts about four hours on two AA batteries. Overall, we found the travel modem to be very compact and convenient--a helpful, handy companion for your Psion Revo or Series 5 organizer. I purchased the Psion 56k Travel Modem as an experiment and in the end I couldn't be (much) happier. I use a Windows CE-based Casio, a Palm IIIe, and a Compaq IPAQ Pocket PC an a regular basis and I hoped to find a modem that would work with all three. Setup of the modem connection with the Casio and the Compaq was effortless, and with a little web-time to download system updates for the Palm (and a little help from PSION to get the proper software)I now have a modem that I can use with my hand-held devices, as well as my laptop. Overall, an excellent product at a price that gets better every month. The biggest plus? it works *well* beyond the one foot distance advertised. I can put it high on a bookshelf and sit comfortably anywhere within about 6 feet. The largest drawback, and the reason for only four stars? It is not Fax capable. This is a great way to get on the internet while on the go. It works with almost all platforms of PDA, be it a Palm, Pocket PC or Psion. Also, because it uses the IRDA port, you can get on the net and still use your expansion slot for memory. My only complaint is the battery life... which falls somewhat short of the advertised "4 hours". If you plan on doing a lot of traveling, you might want to pick up the optional AC adapter for this while you are at it. Other than the battery life, this is a great little unit and well worth the money. I got this to use with my Hanspring Visor Deluxe. The enclosed instructions made no reference to Palm OS. The box had a sticker on it saying something like: "Now supports Palm/Handspring! For more info, go to http://www.psionusa.com./..." but the specific page did not exist. After I searched the web site to no avail, I emailed tech support and in 2-3 days I did receive correct instructions. In the mean time, I had found another user at VisorCentral who helped me figure it out. The poor documentation is the only reason I didn't give it 5 stars. I haven't owned it long enough to comment on battery life. Mine doesn't seem to randomly disconnect the way the editorial review suggests. Maybe it's a Revo issue? As an IR solution, it's well done. During a long page download, I aimed modem away from the Visor, cutting off communication between the 2. The modem did not hang up, and the download gracefully resumed when I aimed the modem back. I really like that there's no cable between the modem and the Visor and that I don't have to take another module out of the SpringBoard slot to use it.